Prevent water and cleansers from entering your intake system when you wash your air box. So far so good. Great fit and works sweet. Soild product for the price. I ordered the Acerbis one and it arrived and was garbage! I sent it back and got this one and its a lot better. This is hard plastic specific for your bike. The Acerbis was a rubber material that you stretched over your bike and it was a waste of money and shipping. This is a no brainer. A clean airbox is better than a dirty one. Fits perfect and keeps your carb and boot bone dry. Cover fits snug and I haven’t noticed any water inside the boot after washings. Works really good, as all twin air products do. Must have for cleaning your bike! Does it’s job, no issues. Very happy. Keeps all water lit even when spraying directly at the air box. Works great. Keep water out of the air box while washing, just as adverized. Bought this so I can clean the air intake chamber/box. Works fantastic. Has a seal that snugs it right up. No water in intake tube. fast shipping from RMATV/MC. Have used these on all of my bikes from big bikes all the way to pit bikes and they have all worked great. Able to wash the bikes up and clean the air box up too ! I always used a bit of grease of the foam rim for extra protection in case it did not fit super snug after installed. I wish I would have bought this sooner. This is great because you won't have to worry about getting your seat wet and damaging the foam anymore, plus you can now power wash your air box and while you have the filter off you can clean it as well. The cover fits and seals up great. Product is well built, perfect fit. Enables you to wash the airbox and not worry about water getting past. A must have! An 'OK' product that gets the job done however be careful not to use normal garden hose pressure when cleaning, it doesn't seal 100 percent. Use grease around the seal and avoid direct hose 'blast' to the carb intake area. Great cover to use when washing your bike. Seal/fitment is excellent. I have been using mine for years and it still looks and performs as brand new. Sealed the box up well cod pressure washing after those muddy races. Does not allow water into my intake, a must have when washing my bike! Washing your bike is a cinch! I don’t think when I installed this I had done anything wrong. It’s fairly straight forward to be totally honest. The fitment was off. I had to get a little creative, and use a couple of washers to get the filter tensioner on my husky to hold the filter cover to create a seal around the air box O-ring. It still did it’s job keeping water and debri out of the carbeurator. I just was expecting it to be a better fit. Before this I usually took out my airbox to wash the oil and dirt out. Now I just slap this on and pressure wash it on the bike. SOOO much easier and I wash more often now.! I would recommend this product, was very helpful when I wash my dirt bike. Fool- proof design. Fits on and clamps down using the stock clamp. One piece sup there's nothing to lose. The insulation feels durable like it'll last for a long time if I take care of it. No water gets by even with the pressure washer. Good fit.. tight seal.. a bit pricey for what it is. But nice to have when washing your bike. This works great to use while washing the bike. I replace the filter with this while I clean the bike and the filter. Seals tight and easy to install and remove. Works wonderfully at keeping things from flopping into your air boot when you have your filter out. Whether it's washing or anything else, it does it's job. It's pretty sturdy too, as I've unintentionally made a habit of dropping it every time I touch it, and not a single speck of damage can be detected. Like a plastic air filter. Works as advertised. Seals nice and tight. Great product! Great seal, key to a clean air box, a little more expensive than its competitors but out performs them. It's a must have. Makes cleaning your air box a breeze. The fitment was spot on and it had a nice tight seal for the pressure washer. No more worrying about getting dirt debris or water in the boot! Must have for getting your bike clean and not flooding your air box. I previously never used the Twin Air wash cover, however I purchased one for my Yamaha and I must say I wish I would have done so a long time ago. Easy to install and reduces the time to clean your airbox. This wash cover makes it very easy to wipe out your airbox and then use the air compressor to ensure a clean environment. I've never used it to wash the airbox with water, only shop towels and air, but it does create a tight seal. Product fits in the air box opening well, and seals tight using the factory air filter retainer. The air box is pretty open on my bike so this is a must have to prevent water in the wrong places while washing the bike. It does make cleaning a little easier and safer when hitting that area. Works like it should. Seems expensive though for molded plastic and a foam seal. Fits snug against my air box and keeps water and debris out while washing. Twin air is the best. Twin air makes a great product. It keeps out all of the mess when washing your bike or storing it for winter. I have tried other air box covers and they don't do the job. I would recommend this product to a anybody who owns a dietbike. Is the sealing surface of this cover made out of rubber or foam? 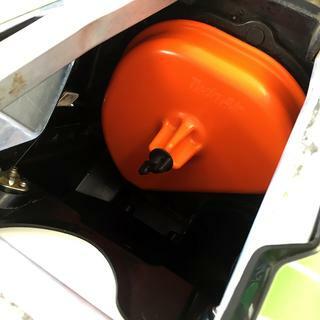 BEST ANSWER: The sealing service is made rubber, but be careful when removing it from the air box after washing as if you use filter grease with your air filter it wants to stick to the sealing area. It is made of rubber. I put a few dabs of glue on the seal to keep it from coming off. I've used them on a few different bikes over the years and they hold up well. More like a closed cell foam, not a rubber gasket. I have two bikes and zero leaks. KTM 450 & 350 XCs. We don't have the domed one but our cover (flat) for Ktm 85sx is a dense foam. The edge that seals against your air box is rubber. Rubber/foam,works good and doesn't let water by. Rubber sealing surface which seals just fine. It's a foam type, but seems very durable. It is a rubber seal. It is foam on mine. Yes, it has a seal. 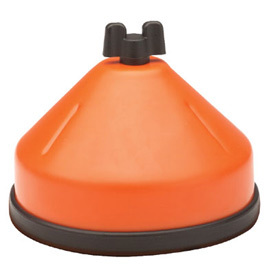 Do you use the air filter cage with this boot ? BEST ANSWER: I do not use the ait filter cage with the cover. No need to do so on the KTMs and Husky's. Not sure about other brands of course. Worked perfectly. Strong seal, even when pressure washing bikes. Keep your airbox clean! Don't risk getting water into your engine while washing your bike. Also, I install these covers when storing my bike for the season. Easy decision. Just buy it. I have used these washing covers on a Honda CRF450 and a KTM 300XC and neither bike required the use of the filter cage when using. Nope. Just slides in and bolts on! I usually stuff a clean rag in the air box just in case some water happens to pass through. No it replaces the whole assembly. No, you don't use the cage. Will this fit a Beta 300RR? Is it universal or I need to buy a specific one for each bike I have? BEST ANSWER: This product is not universal as airboxes differ from bike to bike. You need to buy the one that fits your model. Cheers! You need to buy one specific to your model motercycle. Each manufacturer has different sixe and shape air boxes. i have a 2012 Husqvarna TE250. I need an air box cover for cleaning. Will this one fit or can you tell me which one does? My machine is NOT listed, which is why I asked for help. Will this fit my 2019 Honda crf230? Will it fit a Honda 450 crf r 2006 ? Dose this fit a 2014 kx 100? 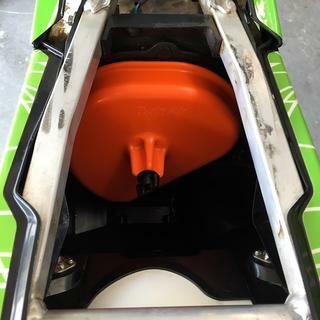 Does this fit a 2016 KTM 350 sx-f air box?